A great accompaniment to warm rice or naan bread, also great used as a dip with raw vegetables, or dried and spread onto bread or rice cakes. Place the lentils, water and spices in a pan, stir well and bring to the boil. Cover the pan with a lid, reduce the heat and simmer. 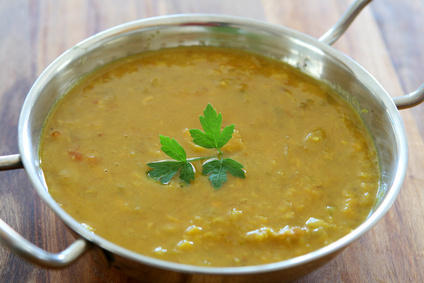 Cook for about 10 minutes, stirring occasionally or until the lentils are just tender. Add more water if needed. When the lentils are cooked, remove the pan from the heat. Meanwhile, heat the oil in a pan over a medium heat. Add the cumin and fry for 20-30 seconds. Add the onion, garlic, chillies and ginger and fry until dark golden-brown or caramelised if you prefer a stronger flavour. Add the onion mixture (tarka) to the cooked lentils and stir well. Bring the mixture to the boil and season to taste, with salt and freshly ground black pepper. Stir in the chopped coriander and garam masala just before serving. Serve with warm rice or naan bread. Make extra and freeze to use for another day. Use any extra as a dip (add more water to make into a dip consistency) and serve with with raw vegetables. Dry the mixture (heat until water reduced), cool and use as a lentil spread over bread, rice cakes, etc.